My name is Cheryl Hildebrand and this is my story related to DVT. 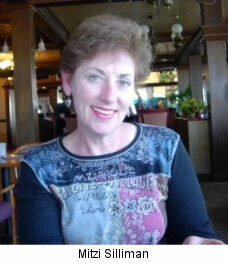 My life forever changed on March 8, 2007 when my partner of 17 years, Mitzi Silliman, died suddenly and unexpectedly from a Pulmonary Embolism caused by Deep Vein Thrombosis. She got up as usual that morning to get ready for work. I woke up to an unusual sound coming from the bathroom. I went in to find her getting sick, but my real concern was the very scary noise that she was making struggling to breathe. She was able to tell me that when she woke up her leg was swollen and really hurt. She took an Advil and shortly started really feeling bad. I called EMS immediately and tried to keep her alert. I knew something was seriously wrong and was very worried. Her eyes kept rolling back into her head and I kept shaking her and saying "Stay with me Mitzi." Somehow she was able to ask me to bring her contact case so she could take them out because her eyes hurt. She said "Call EMS and tell them not to come. I will be fine. Everything is OK."
She was not fine and everything was not OK. From the time I ran to the door and let EMS in the house to the point we got back to her I believe she passed away. They worked to revive her, but as we were leaving for the hospital I heard them say she was in cardiac arrest. A doctor at the hospital pronounced her dead after we arrived. The word got around and soon family and close friends were at the hospital in total shock and disbelief that this could have happened. How could a healthy 51 year old woman be fine one day and suddenly die the next? An autopsy was performed since she was so young and they quickly reported back the results that same day, a blood clot had traveled from her leg to her lungs. Was this something she had been carrying around in her for some time or did it just happen? That we will never know. She had a biking accident the summer before and had some bruising that never went away, but never had it checked out. She was taking the drug Activella to regulate her hormones and to prevent hot flashes. She went to the ER in November 2006 complaining of chest pain and was diagnosed with pleurisy. This never really went away and now I feel that she may have been misdiagnosed and that the hospital didn't do enough tests. Also, we had just taken a trip to Las Vegas and returned on Monday March 5th. It wasn't a long flight, but could that have triggered the clot to move? These questions will forever haunt me. If I had known the warning signs, or if she had been more concerned herself, she might still be here. Those of us who worked with her knew that Mitzi was not at Humana merely to make a living, but to make a difference. Many of us have memories of her small kindnesses and sensible direction, of humor and hard-driving determination. She was a consummate leader; personable and responsive. She communicated her spirit and greater vision about life in many ways. Mitzi worked collaboratively, proactively communicating and partnering with others. To her, how the work was accomplished was just as important as reaching the goal. She valued relationships and set a high standard of integrity. Mitzi was a high achiever and knew how to get results. She made a business impact, demanding the utmost performance from herself and those around her. Just as importantly, she made a personal impact on the lives of others with a spirit of real caring. Mitzi was a very private person, quietly and effectively accomplishing what she set out to do. For all her accomplishments, Mitzi was modest and down-to-earth. Mitzi was also very passionate about and served on the board of Hospice and Palliative Care of Louisville. She was a very giving individual supporting her community and other organizations. The sad irony is she worked for a major health insurance provider who promoted wellness, yet she didn't like going to doctors, didn't complain about her own problems to others and never wanted to have insurance claims. I want to do whatever I can to get the word out to people about DVT so this doesn't have to happen to someone else. After doing some internet searching I found the ClotCare site and started corresponding with some individuals. I was very sad to find out that she died during the very month that is dedicated to National Awareness of DVT. This is the memorial ad I placed in the local paper on March 8, 2008. It has been one year since you were suddenly taken from us. You are missed terribly and your passing has left a whole in our hearts that will always be empty. Your love for life and the way you lived it, your passion for your work and your many accomplishments, your desire to help others and your caring, giving nature makes us all strive to be better people. You were the best partner, daughter, sister, friend, mentor and co-worker that anyone could ever hope for and we were all lucky and honored to have been a part of your life. You touched so many people who will forever hold in their hearts the sound of your infectious laugh, the vision of your beautiful smile that could light up a room and the loving, happy memories of better days. Thank you for all that you gave me. I will love you for the rest of my life.